Rated 5 out of 5 by Corie60 from EXCELLENT HAUNTED HOTEL This was one of the best. Even though the female character was evil you had great empathy for her. A very good story that sucked you in like a book, good puzzles and Hidden Objects were mid level. I was quite impressed with how the game came together. This is one of my favorite series and this may be the favorite within the favorite! The game was a bit short, but that is not always a bad thing. Sometimes they are just stretched out to give the feeling of length for those that feel it gives them their moneys worth. But I think the worth is in the game, short or long. I don't want to give anything away, just demo and see what you think. I believe you will be pleased. Now on to watch the Steelers and Ravens. My Panthers already won...Happy New Year from North Carolina :) Enjoy this very pleasant but creepy game. Rated 5 out of 5 by Sharon376946 from Loved it ! Not since Phantasmat have I enjoyed a game this much. It was challenging but not overly so. I'm not a top-notch player and this one made me think, but I was able to complete nearly all the challenges. This game keeps track of whether you use hints and the objects you've "collected". There was also a continuation of the game's ending. I liked everything about it. Kudos to the team who created this one. Rated 5 out of 5 by TheRealMagicJack from Excellent Game in the 'Haunted Hotel' Series I love the depth put into the atmosphere and sounds / music of this game. I play this game on a large computer screen and headphones and it really pulls me into it's dark and eerie theme. The game is mostly linear, which I prefer, and the puzzles and challenges are great in variety with none impossible to accomplish with a little thinking on my part. I really enjoy this game, job well done and definitely recommended. Rated 5 out of 5 by timothya from Outstanding Effort High on my list of games of the year, this one seemed to catch a certain air of the very best games of the past. It just had that feel. Excellent writing, coherent plot, excellent voice acting. And really creepy, atmospheric music and sound effects. A nice mix of HO styles, and plentiful puzzles, some of them small, some really challenging on the tougher modes. Very nice bonus area that I can't talk about for spoilers. Graphics quite up to the developer's already high standards. None of these stood over the others but every one seemed just a little bit better than its competition. Full marks to everyone involved! Rated 5 out of 5 by bwake47 from ELEPHANT HAS ANOTHER WINNER !! I had started loosing faith in Elephant games, but this is definitely a winner in my opinion. I just loved this game. I didn't want to stop playing and couldn't wait to start again. The atmosphere and music were both eerie, which added to the suspense of the game. I just love "who donit" games and this is another great one. The CE version gives you two endings to the game, but you have to play the bonus chapter after the first ending before you can open the second ending. Now I'm curious as to which ending the SE version will have. Not sure I'm crazy about the second ending, future Haunted Hotel games wouldn't be quite the same. I guess I'll just have to check out the walk-through when it comes out. If you like "who donit" games, give it a try. I think you'll be glad you did. Nice work Elephant Games and BFG !! Rated 5 out of 5 by Penhip from A FANTASTIC SERIES THAT JUST KEEPS GETTING BETTER!!! HAUNTED HOTEL IS A PERFECT EXAMPLE OF A SERIES THAT HAS MANAGED TO PRODUCE EXTRAORDINARY SEQUELS... and ELEPHANT GAMES OUTDID THEMSELVES WITH THIS RELEASE! The game starts off with an unexpected twist as we learn that our own trusted Detective James is... nah I won't spoil it, but let's just say that there is a resounding NO!!!!!... THEY DIDN'T... THEY WOULDN'T!!! going on in my head ... so while we're at it I want to say thank you very much for not going with the Alternative Ending. Whew... that would have been a huge Bummer!... Not to mention a bit anti-climactic given the driving goal of the game. It did, however, make me aware of just how attached you can grow to characters in any medium when done artfully leaving no doubt that Haunted Hotel and Detective James definitely go well together. By the way... Was it me or did James look very different in the opening cut scene? Technically supurb graphics, creative mini-games, HOS, a seriously twisted storyline (in all the good ways, of course) and disturbed villian (the best kind), topped with one of the best musical scores I've ever heard in the adventure game genre easily make HH one of the Best Games of 2014. This is a must buy for HO/Adventure and Haunted Hotel fans. My recommendation is to go with the CE for the bonus chapter alone. ENJOY!! Rated 5 out of 5 by koolcowz from Great Game! I don't usually review; however, this game was great to watch unfold. The graphics were excellent and the music actually added to the game. The story was well done. This is the kind of game that keeps you interested and wanting to play more! Rated 5 out of 5 by skullfun from Elephant delivers a golden peanut in Haunted Hotel Death Sentence Third in the series Haunted Hotel: Death Sentence is spooky, but perhaps not actually scary, since all of its jumpscares are telegraphed very clearly, and it's hard for me to take a corpse reveal that all but screams, "Get in, loser, we're going shopping" seriously. Visually, it's a rare treat, with crisp visuals, rich, dark colours, and a great flair for the macabre and the creepy. If you enjoy the sort of ghoulish camp you'd find in something like Christopher Pike's Fear Street, chances are all the mysterious shadows and grinning skulls will be right up your alley. The story might move a little quick in the way it reveals things, with more pacing given to shock value than character development, but the "justice from beyond" trope is executed well. It's a fairly fast-moving game, and most of the difficulty will largely come from how much back-tracking you'll be expected to do, though the fast-travel map means that isn't quite as frustrating as it might have once been back in olden times. The only problem with Death Sentence is actually that it falls into a pattern. Find out who the next victim will be, find an item in their case file, track them down, repeat, repeat, repeat. Still, the game's stunning presentation and genuinely sympathetic villain will keep you hooked 'til the end, though it's not likely to take anyone much longer than three hours or so, and it still feels like it leaves a lot of questions unanswered as to how certain things happened. The soundtrack is a particular standout, with a few genuinely pretty pieces and a creepy ditty that know when to take a backseat and let the atmospheric sounds set the stage. The ending sequence is actually pretty well executed, and if you pick up the Collector's Edition, the bonus chapter is actually a surprisingly satisfying addition... neither a simple prelude, nor something that feels lopped off of the main story, instead centering on a little girl who's gone missing at the hotel's island after the main game ends. While it all might be over too soon, Haunted Hotel: Death Sentence is still a fantastic blend of thriller and supernatural horror, with high production values and a flair for drama that makes this demo well worth checking out for any casual adventure fan. Rated 5 out of 5 by Wyllemina from Excellent ! Excellent game, I have yet used the demo but I hope and look forward asking in French. The puzzles are not too simple and origninalité mins in games. The dark mood of the story I like a lot. I just regret that it is not yet in French and I'm not sure to hold far! Rated 5 out of 5 by 5994fairy from Great game! You find yourself in a somewhat dilapidated and spooky hotel in a race against time to find out what has happened to your detective colleague and friend, James. Is he alive or are you too late.... Graphics are beautiful and evocative - they really contribute to the feeling of menace which pervades this game. Sound and voiceovers also add to the atmosphere. HOGs and games are enjoyable - not particularly challenging but I did skip one! The actually gameplay works well, but it took me a while to work out there might be several useful items in the same place! Must be a bit dense today! Collectibles and stuff as you would expect in a collector's edition. If there was anything morphing, I missed it. There are a few dark hints about your friend's past......quite intriguing. Only criticism: quite short. I finished in under 2 hours? not sure I'm that good - played it on advanced; skipped one game; hinted once; consulted strategy guide once. Rated 5 out of 5 by ahunter0701 from LOVELY GAME!!!!!! Great game!!! I really enjoyed this one probably in my top ten games! Excellent graphics and loved the music The storyline was awesome such a great mystery murder this will be a game you could play over and over and enjoy every time I definetley recommend this game would give twenty stars if i could Enjoy!!!!! Rated 5 out of 5 by tobysue09 from Now that's what I've been waiting for!! Boy, did I miss this creepy hotel! I have played the entire series, and I think they just get better and better! This one has got it all- great visuals, music, storyline, puzzles, collectibles. I hope they just keep making them, cause I'm going to keep buying them!! Love you, Elephant Games!!! Rated 5 out of 5 by blessed34 from Creepy fun! I loved this game! The graphics were gorgeous! No cute helpers, creepy music, not too many hos and I liked the story. One of my favorite games of the year! My only complaint is that it was on the short side. Rated 5 out of 5 by boogienites from Thoroughly enjoyed this game Finally, a game that made it reasonably able to meet the achievements while giving a decent story line. There were times I literally jumped when things happened. Was it the most difficult game ever... no. But, I for one, enjoy a game that gives a chance at meeting all the achievements. I actually enjoyed this game more than the recent MCF game which I found difficult and boring. Yep, like this one a lot! Rated 5 out of 5 by cuorips from At last something fun and slightly creepy ! A very good game worth the money, HO are different and challenging, story line is very good, lots of things to do, I really enjoyed myself, will play it a few times to get the highest rewards, this was a pleasure ! Rated 5 out of 5 by mmdgaston from great series i have played all of these.....while this one was great, the only downside, it was too short for me. i wish there had been more moving around outside of the main house....but it was wonderful.........buy it . Rated 5 out of 5 by jquick from The Haunted House of Fun, Fun , Thrills and More Fun!! Hi BF friends! It's been a while since I wrote a review and I use to write a Book. I wanted the reader to know the greatest and most specific details of the game. Well I also got to play the Beta version on Haunted Hotel; Death Sentence and even at that time I could find no faults at all in this game as well as being captivated with he game from the onset. This game has had me waiting on pins and needles for its release and definitely gets my vote for game of the year!! Now, I am sort of an oddball and usually turn the music off when I play because after a while it becomes redundant and a distraction, not with this game. I do listen to all the effects, except certain ones in moderation, because this game was thought out so well out- down to the last detail that everything it has to offer combined makes for a 5 star plus rating. Everything is great about it. The prologue, the voiceovers, the awesome graphics , the originality (novice HOS and mini-games. There is not a minute of down time in my opinion anywhere in this game. I had gotten so burned out on the repetition of storylines, cluttered HOS, no originality or freshness in anything released in so many games this year. Curiosity killed the cat and I implore you to go with your curiosity-if nothing else and try the demo. You will not be disappointed!! This is by far the Best Game of 2014 to this player!! Have fun and Enjoy! Rated 5 out of 5 by slm1022 from Haunted Hotel is a great game Really enjoyed the demo version. Sure wish I could afford to buy the game but at $19.99 I just can't afford it. Fixed incomes do not allow for this steep of a price. Good game though! Rated 5 out of 5 by Torpedo1 from Hauntingly Fantastic This game is the best of the year. The voice overs were fantastic, the music was haunting, I loved how the storm clouds moved, and all the little scares here and there. I just want to go on and on what this game is. It has good HO's, collectables, awards, a jump map, and a good hint system. If it was pay day I would buy this right now. You can control the brightness of the game and can custom choose how you want to play. I can hardly wait to own and see where it all leads too. Wickedly fun. Rated 5 out of 5 by grapeleaves from Awesome Elephant Games as Usual.!!!!! More please. Every Day could be alright with me. Big Fish YA.!!! I had a little trouble getting this game but I had faith and I just don't want to end. You are so talented you are the great developers. Don't stop. I hope you realize how we enjoy your work. Rated 5 out of 5 by pennmom36 from 5 Star Hotel......Haunted Hotel! This is one hotel you may not want to stay at if you are guilty of just about anything! This owner has taken it upon himself to enact justice upon the guilty, the punishment, DEATH! James has written you a letter that claims he's already dead, this just can't be true, (because dead people can't write letters) so the Holy Mountain Hotel is our next destination! No need to pack a suitcase, you won't be enjoying your stay with all those ghosts roaming around! (although I would recommend a flashlight, it's really scary folks!) The graphics....creepy and unnerving, the music will send chills down your spine, I'll never sing that lullaby to a baby. This game is fantastic, everything is perfect, I couldn't ask for more (that rolling ball freaked me out!) There are 32 glowing green antiques to collect, and of course the usual character figurines have returned giving us a bit of insight on the dearly guilty departed. There are also several achievements to earn and almost every inventory item requires some type of interaction before using it. 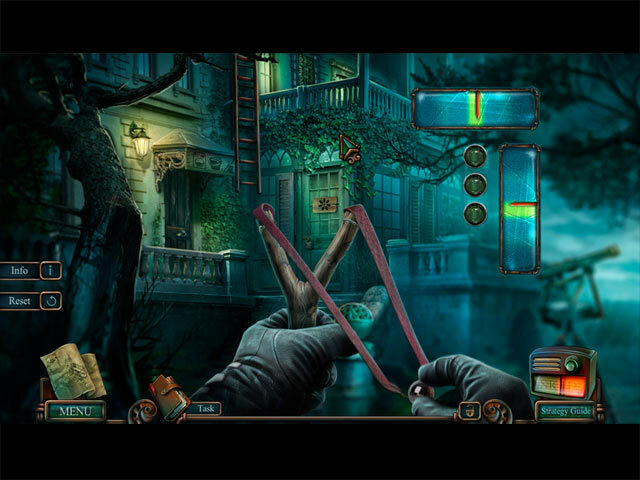 The Hidden Object Scenes are the typical interactive list finds, but there are a few silhouetted shape finds as well just to break up the monotony. Mini games are in abundance, and I loved em all! Just to name a few, one game required you to swap metal plates to match the grooves on the plate in the middle, the plates could only be swapped in specific positions, just to make it more challenging. Another game required you to place color coded wires into two different sockets with symbols that would form the correct numbered code shown when combined. Even the plus sign inventory items had fun puzzles! This Collectors Edition has replayable mini games, Wallpapers, Concept Art, Music, Achievements, Character Figurines, Esrael's Antique room, Screensavers, a built in Strategy Guide, and an ALTERNATE ENDING!!! < that my friends is way cool, enjoy! Rated 5 out of 5 by MSBAM100 from Judge, jury and executioner! 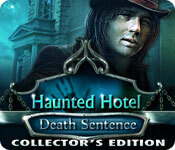 What a great new entry into the Haunted Hotel series! Only this time, you are without your partner James, and you must find him and save him -- or is he already dead? It seems the owner of the Holy Mountain Hotel invites guests to his hotel. But these guests seem to be guilty of a crime, but found innocent in court. Esrael Blackthorne, the hotel owner, seems to be sentencing the guilty guest to death, and then killing them. There is the surgeon who killed the patient by operating while intoxicated. And the race car driver who killed a mother and child with his car, then left the scene of the accident. But what about your friend James? You are assisted in your discovery by dossiers about the guests, plus videos you can watch after you assemble the projector. And James leaves you notes along the way, as well. And just when you think you will get some answers, you find Esrael dead as well........and the demo ends! For bonus bling there are 11 character statues to collect, plus Esrael's antique collection of 22 beautiful jade and jeweled objects to find. They are not hard to discover, but still fun to find and read the item's description. The HOS are not difficult, but relate to where you are in the game -- lists or silhouettes. The mini-games are not unique, but still fun. There are bonus mini-games, plus the bonus chapter, and an alternate ending as well. One nice feature is the ability to change the brightness of the screen. Plus the four modes include custom. Try this and enjoy! Rated 5 out of 5 by bmn5772 from WINNER WINNER BIG FISH DINNER!!!!! You have renewed my faith in BFG........this game is awesome....thanks!!!! Rated 5 out of 5 by biscuitsmama from Haunted Hotel Death Sentence is One of he Best Games This Year In what promises to be one of the best games in the Haunted Hotel series we have an eerie cutscene to start the story. You are reminiscing about some of the cases you have worked with your associate and friend James when you happen to receive a letter from him where he tells you that he has died. He directs you to find answers at the Holy Mountain Hotel – a very dangerous place. Will this truly be the end of your friend’s life or will you somehow be able to save him? Needless to say, you rush off to the Holy Mountain Hotel to seek what answers you might find there and hopefully save James. The game has incredible graphics and the voiceovers are absolutely wonderful. I love the creepy recitation of Six Green Bottle in the beginning cutscene. IMHO, this is definitely a game that you will want to play with the sound. Not only are the voiceovers excellent but the intermittent sound of a woman humming in the background as well as the creaking floorboards that we can hear add to the overall creepiness of the game. 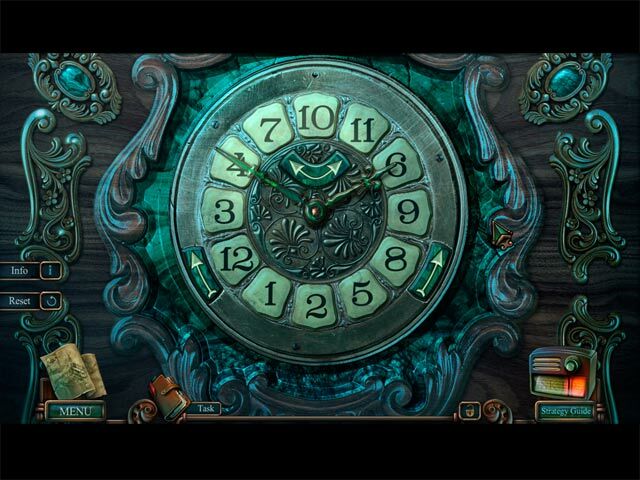 I play a lot of HOPA games and this one has possibly the best and most realistic sound package I’ve encountered in a game. We have a journal that contains our notes as well as dossiers of the victims as we progress through the game. There is an interactive, transporter map that can be customized to show where you have active tasks if you choose the custom settings. Aside from the standard tools, I didn’t acquire a helper or find any of the tools that some might consider gimmicks. This is a straightforward game that relies on a great storyline and your skill as a player. What a novel idea!! Elephant has stretched their abilities and now includes various types of interactive HOPs, some are the standard list type and others are silhouette type. You will encounter some great puzzles in the game that add to the gameplay - some are even a bit more difficult than the ones we normally encounter: not because they are hard to figure out what to do but because they take some time to manipulate. I always look forward to solving lock type puzzles so I enjoyed the first puzzle I encountered. Is this a true CE? Well some of you might not think so but it is a matter of personal preference. When CEs first came on the scene they basically had a bonus chapter and the integrated SG. Over the years they have evolved to include morphing objects, collectibles and achievements. Well, in this game there are mainly three different types of collectibles to find as well as the ever-present, meaningless achievements that are earned just by playing the game. I didn’t find any morphing objects, which is okay with me since sometimes looking for them interrupts the flow of my gameplay. The game extras also include an alternate ending as well as the bonus chapter, SG, wallpapers, and music. Some might think that Haunted Hotel Death Sentence is light on extras but, IMHO, the game is so excellent that I don’t really mind. In the end, Haunted Hotel Death Sentence is as the top of my list of best games in 2014. Recently we have had so many games where the stories just seem incomplete or thrown together and Death Sentence is well thought out and cohesive which makes this game a wonderful experience to play. I am not left scratching my head trying to figure out what is going on because the pieces of this puzzle come together to make sense. I played the beta for this game several months ago and just replayed it again, with the same enjoyment and sense of excitement that held my interest and let me know this is a game that I must have. 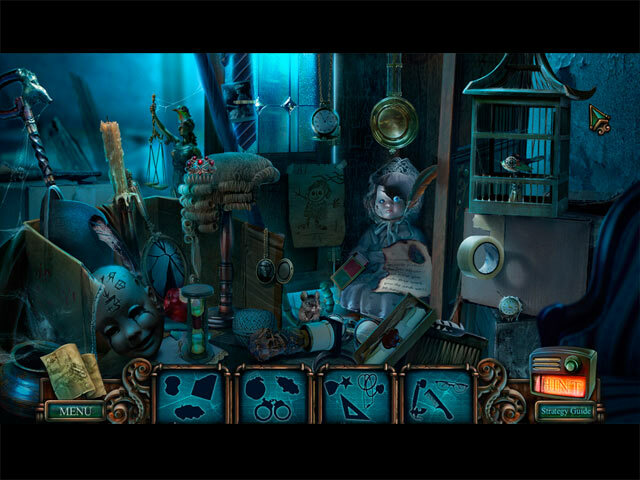 For me Haunted Hotel is an immediate purchase with or without a sale. This is a wonderful game to play on one of the many rainy days we have had recently here in CA. As always, I recommend that you at least try the demo to see if this is a game you will like.